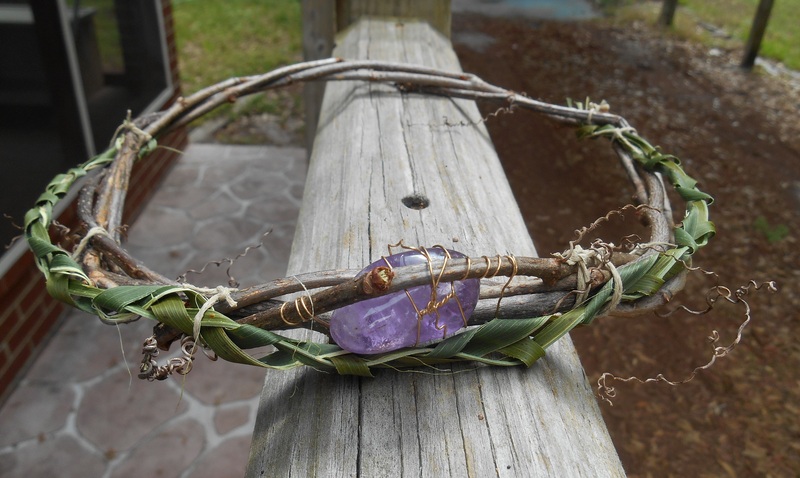 I forgot to post a few things in my ‘Ostara Ritual’ post. 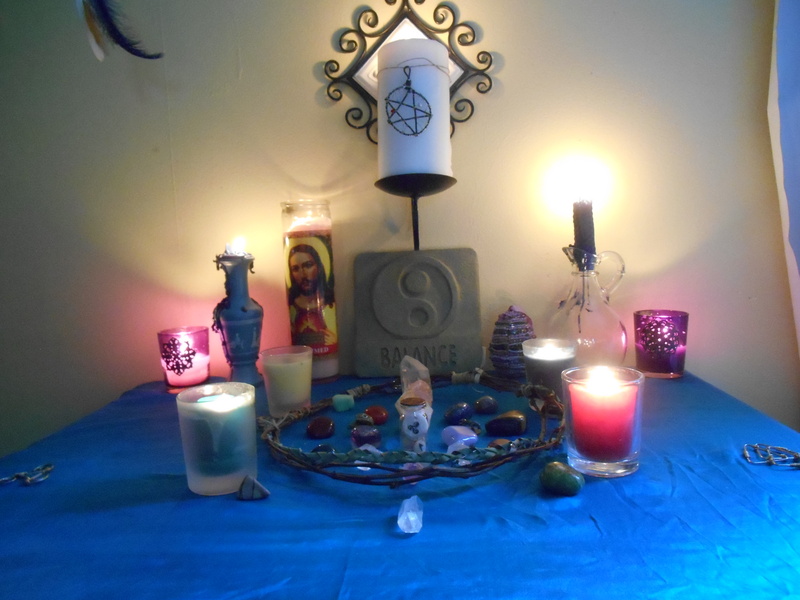 I wanted to show my Ostara Altar because it shows my new altar setting. My old altar set up was on top of my dresser. My dresser is tall thought and I had to stand at my altar. Now it’s on a short table where I can drag my meditation cushion over and sit in front of it. Since I don’t practice magic, my altar will be used for prayer and scripture reading as well as holding my crystal grids and other spiritual things. 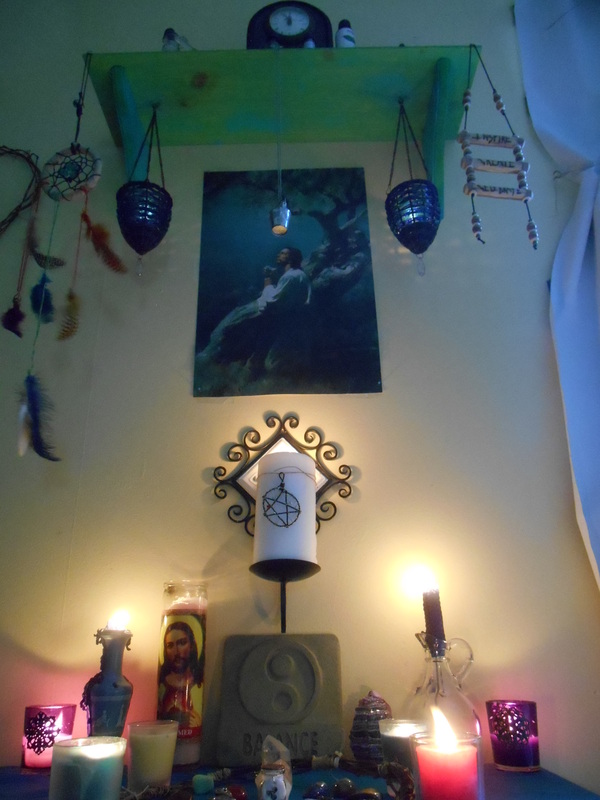 I also hung a shelf above my altar as kind of an extension. It holds my clock, mortar and pestles, sage stick and dish, and a few other things. Here’s the view from my cushion. 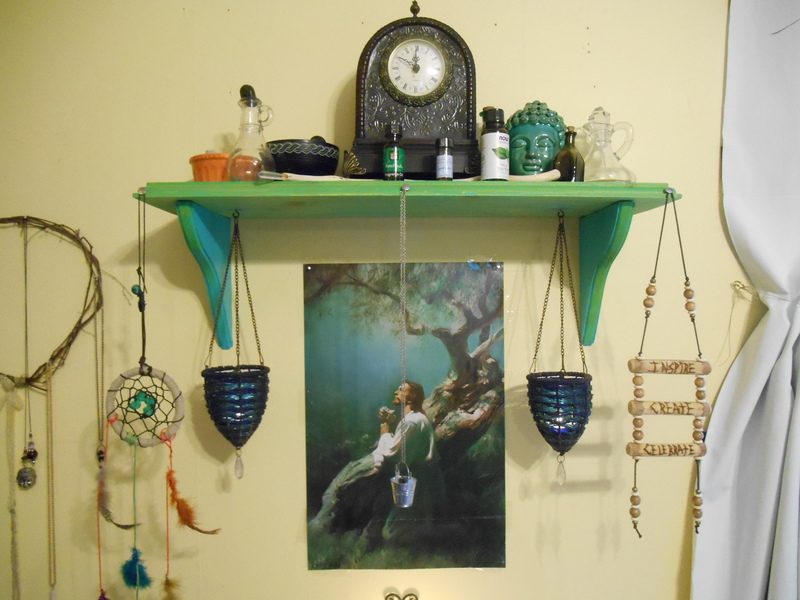 My shelf which includes and dream catcher I made a while back and blue hanging candle holders. This silver thing in front of the picture of Jesus is actually a tiny bucket I found at Hobby Lobby. It was so cute that I had to get it. I didn’t know what I was going to do with it at first, but it was only $0.79 so why not? 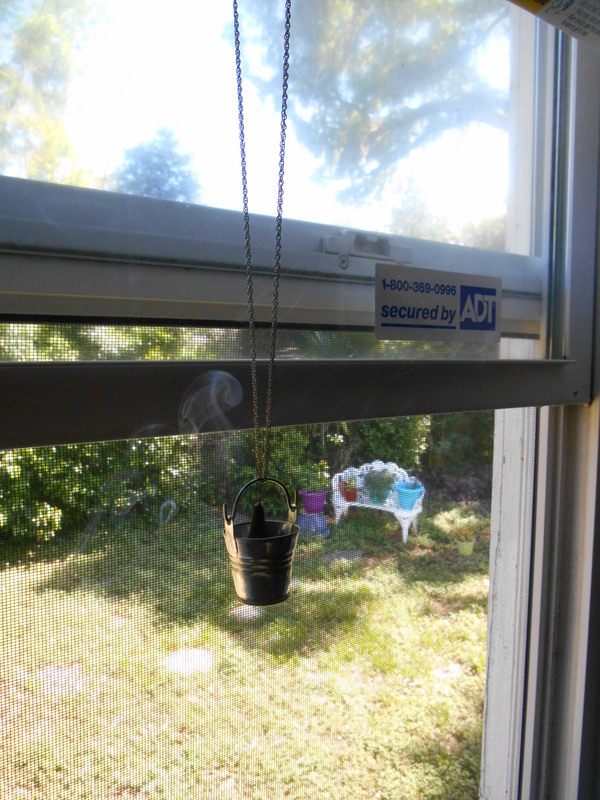 One day I decided to hang in on a necklace chain and use it for a cone incense burner. I love it! I hung it in front of the open window for the picture so you could see the smoke. My altar lit up. 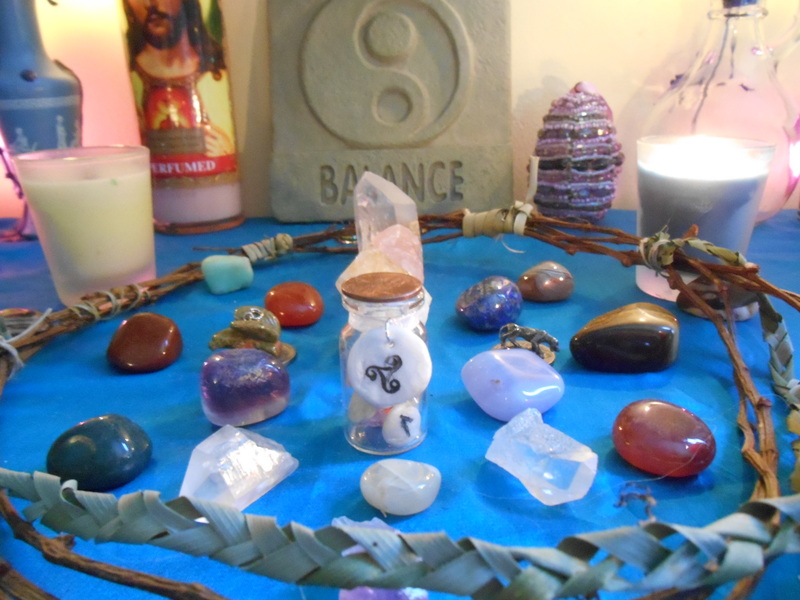 I’ve never been into Easter that much, so I just keep my altar simple as far as Ostara ‘decorations’ went. There’s my Jesus candle to represent the Christian part of Easter (I kind of celebrated Easter as well as Ostara). In the middle by the candle is my balance plaque thingy. It’s something I’ve had for a long time and thought it would be perfect since Ostara is about balancing light and dark. In the middle foreground is my ‘New Beginnings’ bottle I made from this post. Then on the right side of ‘balance’ is my lone Ostara decorations of a beaded egg I found in a box of stuff my mom gave me. 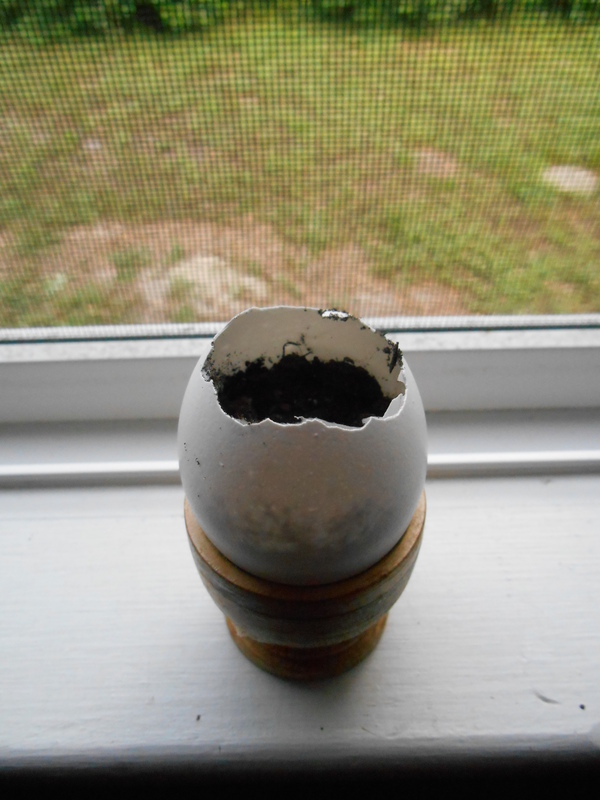 At the ritual we got plastic eggs that were filled with a mix of seeds to represent growth/new beginnings. I planted mine in an and won’t know what it is until it starts growing. They just kind of randomly mixed the seeds together. 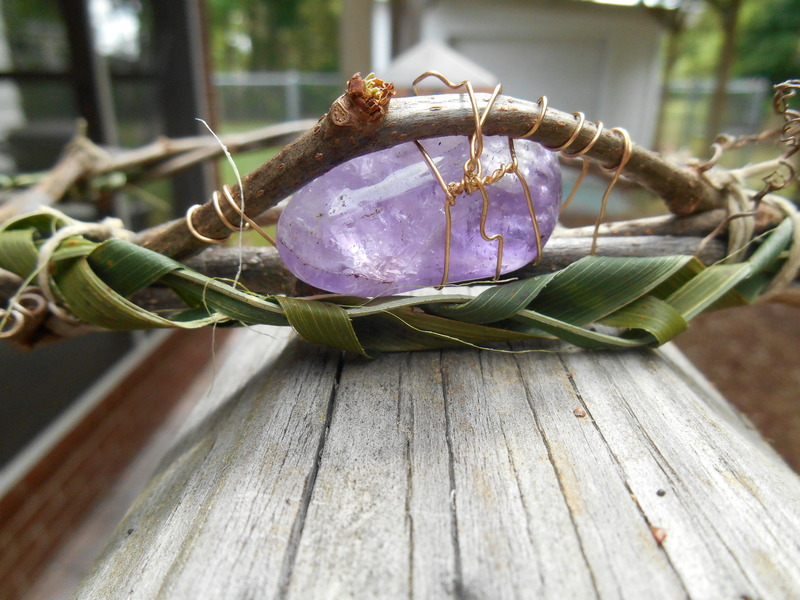 I made is using vines, hemp, palm frond for the braid, and and amethyst with copper wire. I posted these pictures on Tumblr and they got over 3,000 notes, meaning they were really popular. I will either make more to sell in my Etsy shop Solnix or make a tutorial. Or both. We’ll see. Well that’s everything I wanted to add to my Ostara themed posts.